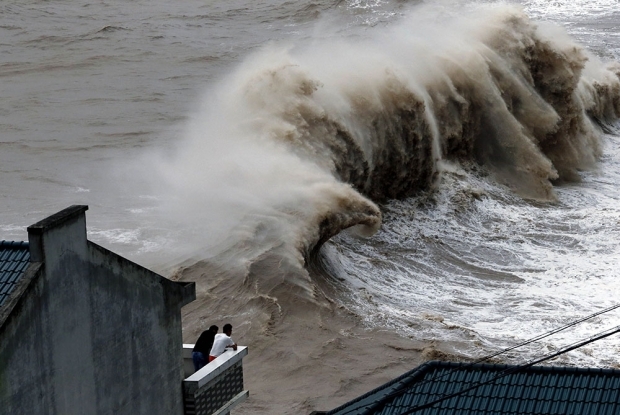 Waves from the approaching typhoon Chan-hom come ashore near the city of Wenling, Zhejiang province on July 10. Typhoon Chan-hom lashed Japan’s Okinawa island chain on July 10 as it pushed towards Taiwan and onto China, leaving more than 20 people injured. In August 1975, Typhoon Nina, one of the most powerful tropical storms on record, surged inland from the Taiwan Strait, causing floods so catastrophic they overwhelmed dam networks around the city of Zhumadian in China’s Henan province. When Banqiao Dam on the Ru River finally burst, it unleashed a wall of water that rushed downstream, claiming an estimated 230,000 lives. Look back through China’s press at the time, however, and it is as though this unfathomable tragedy never occurred. Not one of China’s official newspapers ever reported the story. The silent horrors of Banqiao are a fitting metaphor for the Chinese Communist Party’s deep fear of tragedy and its destabilizing effects. And they help us explain why, even today, in an era when the ubiquity of the mobile Internet makes cover-up impossible, the Party strives to control coverage of tragedies like the recent capsizing of the Oriental Star cruise ship on the Yangtze River. Packed with 454 tourists and crewmembers, the Oriental Star capsized in rough weather at 9:28 p.m. on June 1, along a once-popular scenic route that has fallen on harder times since the downstream completion of the Three Gorges Dam, the world’s largest hydroelectric facility. After a weeklong recovery mission conducted amidst a stranglehold on information, there were just 12 survivors, including the ship’s captain, Zhang Shunwen. For China’s leaders, tragedy is threatening because it summons raw human emotion—and when that emotion fixes purposefully on the human causes of calamity it becomes its own destructive wave, with the potential to undermine political legitimacy. Speech and popular will in China have in fact long been equated to forces of nature. “Stopping the mouths of the people is more perilous than stopping a river,” goes an oft-quoted saying from Discourses of the States, a text dating back to around the fifth century BC. While controlling public opinion is a political imperative, the saying suggests, allowance must be made at the same time for the release of building pressure—otherwise, resentment will only amass and threaten the entire project of control. The people must be allowed, in other words, to speak their minds and make known their wills, even if their freedom to do so is limited as a matter of political necessity. The tension between obstruction and release is one of the defining dynamics of media control in China. And this deep cultural understanding of public opinion control as hydrological engineering has even more ancient associations in the story of the legendary leader Yu the Great, who is said to have revolutionized flood control sometime before 2100 BC by recognizing the need for channeling and irrigation as opposed to simple obstruction. The story of Yu the Great “harnessing the waters” is referred to in Chinese as dayu zhishui, a phrase in which the third character, zhi, is also the character for “govern,” “rule,” or “tame.” The story of Yu the Great has long been understood also as a political fable about the ruler’s need to control, channel, and harness the will of the people. The tension between obstruction and release is one of the defining dynamics of media control in China. In more recent times, Yu the Great had a role to play in the January 2013 Southern Weekly incident, one of the most serious political showdowns of the Xi Jinping era. 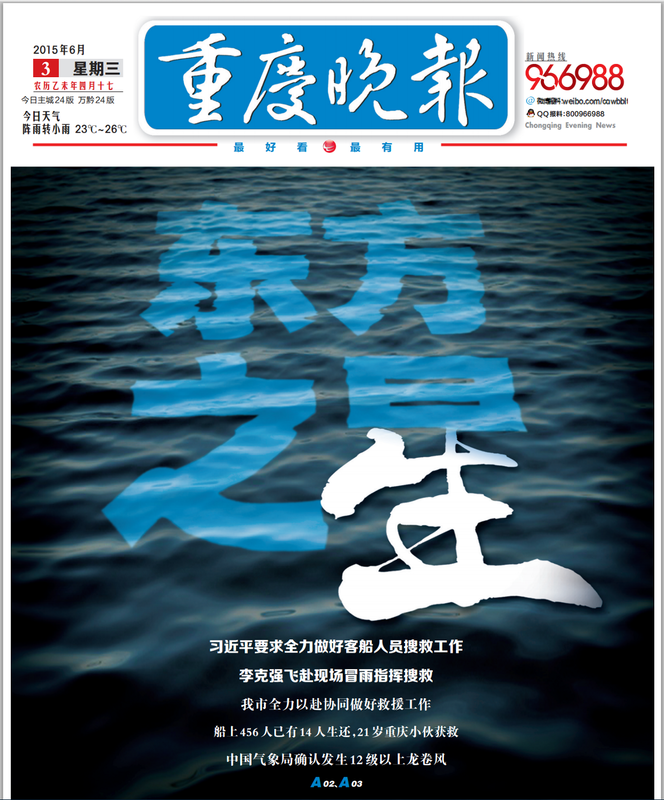 As editors at the once-great newspaper planned their New Year’s special edition toward the end of 2012, just as Xi was coming to power, they decided on a cover illustration depicting Yu the Great’s “harnessing of the waters.” China was entering a period of intense social and political strain, arising from two decades of rapid but uneven development. The editors felt that the allusion to Yu the Great was a powerful yet oblique comment on the leadership’s need to embrace criticism in order to quell rising public anger (which Chinese historically associate with floodwaters). The subtext was also sorely relevant to Southern Weekly’s experience over the previous year, during which it had suffered intrusive prior censorship to a degree completely unprecedented in its 30-year history. In the end, much of the Southern Weekly News Year’s edition was quashed, topping a year of galling defeats for a newspaper. The painting of Yu the Great was grudgingly permitted, but the crowning humiliation came when propaganda leaders, unbeknownst to issue editors who had already signed off on the page proofs, demanded the addition of a preface that praised the achievements of the Chinese Communist Party—even quoting its official mouthpiece, the People’s Daily—and proved to be full of serious factual errors. One of the most foolish was the dating of Yu the Great back 2,000 years rather than 4,000. 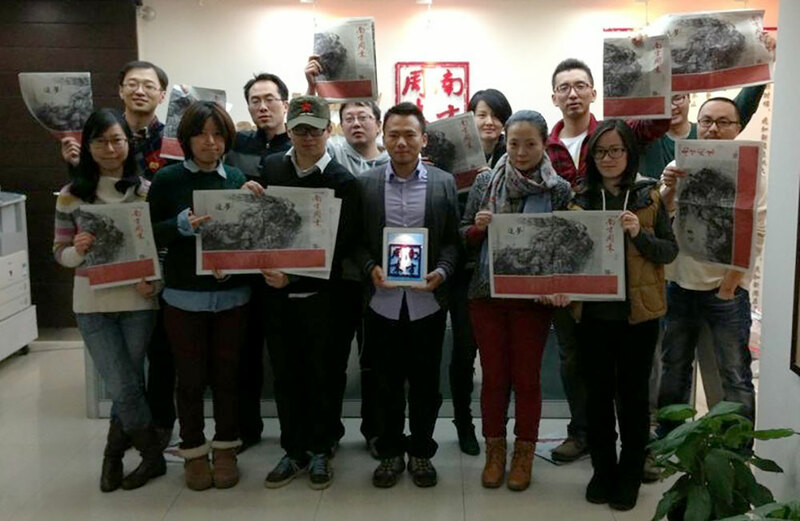 Members of the staff at Guangzhou’s Southern Weekly hold up copies of the January 2013 New Year’s special edition of the newspaper that was heavily censored by Party leaders, prompting a staff protest that become international news. News of the blatant intrusions at Southern Weekly, which went public through Chinese social media, unleashed a wave of public anger over government censorship. It took days for Party leaders to stem the outflow and gain control of the story. Today, more than two years later, the Southern Weekly incident still reverberates through China’s increasingly constrained public sphere, justifying intensified control of the media, academia, and civil society. One of the chief themes of the 2013 special edition, the need to protect in practice the rights (including freedom of expression) guaranteed in the country’s constitution, is now taboo in China’s media and its classrooms. The very word “constitutionalism” has become a red flag. Xi Jinping, it seems, is more interested in shoring up the levees than letting ideas through. The point concerning public opinion is to employ methods of channeling (yindao). In ancient times, they understood that stopping the mouths of the people is more dangerous than stopping up a river. And so we know as well about Yu the Great Taming the Floods (da yu zhi shui). This doesn’t mean that water control projects didn’t begin until Yu the Great’s time. His predecessors also busied themselves with dam projects. But they failed to recognize a key principle—that if you only dam up water, there is no way in the end that you can control it. Yu the Great learned from their experiences, applying a combination of channeling and stopping up, inhibiting flow here and opening up flow somewhere else. . . . And so, Yu the Great’s control of the waters was successful. Public opinion is even more like this. Language must be drained, it must be channeled. But in this process of channeling there will always be some things, for example things that attack our [political] baseline, that we must tame [or “govern”] in accord with the law . . . The overarching metaphor governing information and public opinion in China today remains hydrological, recognizing the speech act, and its collective power, as a force of nature that must be tamed. The official term, introduced by President Jiang Zemin in the aftermath of the political torrent that was the spring of 1989 and the June 4 crackdown, is “guidance of public opinion” (yulun daoxiang)—the idea that speech must be properly directed, in order to preserve social and political stability. This involves, on a daily, hourly, and now sometimes minute-to-minute basis, instructions from the propaganda department and other agencies concerning what cannot be reported and what must be reported (and an array of possibilities in between). The project of “guidance” is not merely what we tend in the West to call “censorship,” an act of cutting, excising, and obliterating; rather, it is a process of diversion, of redirection. Public opinion is not stopped—it is harnessed. Again, that complexly layered Chinese word: zhi. To govern, harness, or tame. Essentially, as the nature of the information landscape had changed, favoring Internet-based products over traditional media, “guidance” had become a largely passive enterprise. While the Chinese Communist Party managed to restrict the nature and flow of information through the state-controlled print and broadcast system, it was losing the agenda online, particularly on sudden-breaking news stories—exactly the kind that cohere public anger. Hu Jintao’s answer to this dilemma was a two-fold strategy of constraint and discharge: 1) restrict information to that gathered by trusted (by the Party) official sources, like Xinhua News Agency and China Central Television and 2) use the Internet and commercial media to more actively amplify these restricted messages. “Channeling,” basically, was about harnessing the power of for-profit newspapers and magazines, commercial Internet portals, and eventually social media in order to better inundate the public with information from state sources. Hu Jintao spoke of channeling as a means of “grasping discourse power” (zhangwo huayuquan). Journalists gave his new policy term the catchier nickname “grabbing the megaphone” (qiang laba). But this was ultimately about taming the flood in the Internet age. And so we return to China’s most recent tragedy, the capsizing late at night on June 1, 2015 of the Oriental Star cruise ship on the Yangtze River. A great many questions remain about the Oriental Star tragedy. Why, for example, were distress signals so delayed? Were the proper safety precautions and procedures followed before and during the cruise ship’s fateful journey with 454 people on board? Most of these questions have not been properly addressed in media reports, and probably never will be, thanks to early restrictions imposed by the Central Propaganda Department. Within 12 hours of the disaster, a directive went out to media telling them to pull back their reporters and stay away from the scene. They were to use only official news releases from Xinhua News Agency and China Central Television. This was, essentially, a classic combination of “guidance” and “channeling.” First, news was shut off at the source. Next, information flow was moderated through official state media. Finally, with the fountainhead effectively controlled, a tame fountain of information was directed through news outlets across the country, which meant the authorities were able to harness the power of websites and commercial media to get out their own “authoritative” version of the facts. 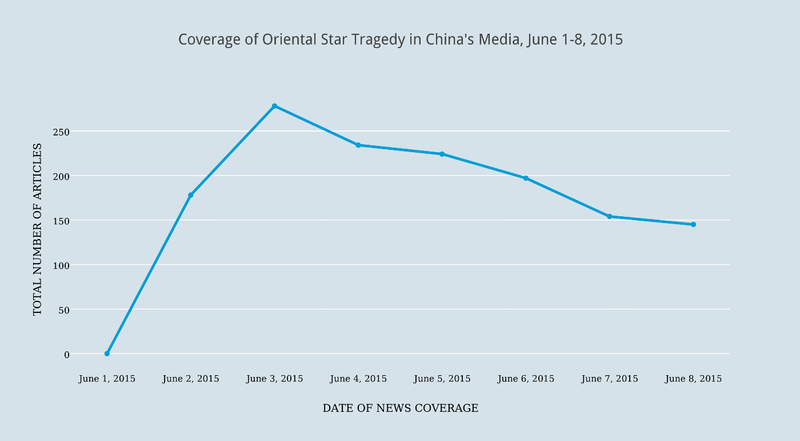 Here is the basic pattern traced by the flow of information on the Oriental Star tragedy inside China during the first seven days. Source: WiseNews Database, includes total of 1,410 articles returned from newspapers, news wires, and URLs. Note that articles are not exclusive, many being official news releases published in different newspapers or online sources. It might seem initially that there are a surprising number of stories, peaking at 278 on June 3. The bulk of that coverage, however, comes from just three official sources: Xinhua, CCTV, and China News Service. Page 1 of Guangzhou’s Southern Metropolis Daily, a leading commercial tabloid, on June 3, 2015. Image and content are from Xinhua News Agency. If you bought a leading tabloid newspaper off the newsstand on June 3, it almost certainly looked something like the one on the right, Guangzhou’s Southern Metropolis Daily. And the copy you read in that paper would likely have been from Xinhua. Turning to local and national Internet sites, you might also have run across the subdued diversity of coverage offered by China News Service, which filed prolifically on both June 2 and 3. China News Service coverage hewed closely to the central narrative—that leaders were working actively and around the clock, doing absolutely everything they could—but also tended to pick up more localized accounts from official government and military Weibo accounts. This story, for example, is based on posts by the official Weibo account of the People’s Liberation Army Daily, and offers details on the PLA’s deployment of rescue crews to the scene of the cruise ship tragedy. China News Service, June 2, 2015—According to the official Weibo account of the PLA Daily, the first group of medical personnel from the Guangzhou Military Region has arrived at the scene of the sunken Oriental Star vessel. The medical team is led by Liu Chengyong, Deputy Minister of the Joint Logistics Department of the military region’s Health Department, and has 38 personnel in all, including 36 hospital personnel, 6 vehicles, and a set of relevant rescue equipment, such as ventilators, defibrillators, ECG monitors, etc. The advance group set out at 8:10 a.m., and the next at 8:30 a.m. They are expected to arrive at the scene of the accident at 12:10 p.m. The story is not quite so simple. There were rare yet notable exceptions. But the bigger story here may in fact not be the familiar nature of controls so much as the unfamiliar extent to which those controls actually succeeded in silencing professional journalists and media in China. A certain failure in terms of meaningful transparency, the Oriental Star tragedy might be unmitigated success from the standpoint of the Chinese Communist Party. This time, when tragedy and public ire met with the impulse for political control, the floodgates held. I’ll come back in a moment to the larger issue of what the Oriental Star tragedy tells us about public opinion control under Xi Jinping. But first, let me get to those notable exceptions I mentioned. And the pattern of anomaly I find most interesting in this case is that of media in the Yangtze River valley—from Shanghai, where the river meets the sea, to Nanjing, where the cruise ship set off, to Chongqing, where the ill-fated journey was to have ended. Three commercial newspapers on June 3, 2015. Same images, same content. 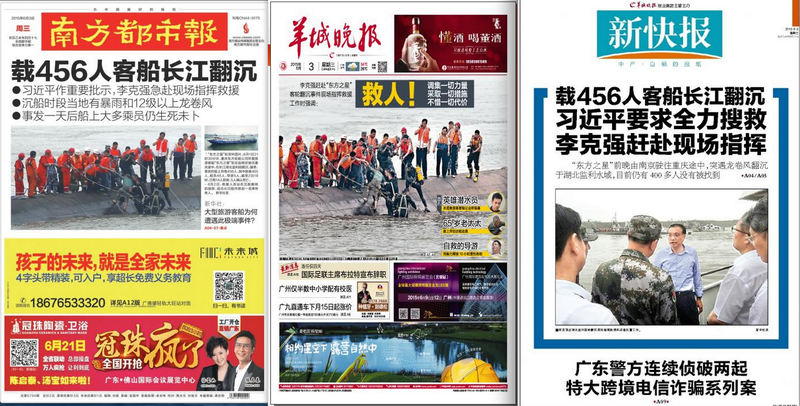 One of the most compelling arguments for the numbing uniformity of Chinese coverage has been a visual one: Images of front pages from newspapers across the country on June 3 all featured the same Xinhua News Agency photograph of a survivor being brought up onto the capsized hull of the Oriental Star. Generally, we expect uniformity from official Party newspapers but see more variety of front-page treatment from commercial spin-offs, which hope to attract eyeballs at the newsstand. The papers above are all commercial, from Chengdu (left), Beijing (center), and Guangzhou (right). All use the same Xinhua image and content. The June 3, 2015 edition of the Chongqing Evening News departs noticeably in its front-page design from other papers across the country. The news itself follows the pattern we’ve described already. The top headline is about President Xi Jinping, who has exhorted everyone to do their utmost in the rescue effort. Immediately below is the news that Premier Li Keqiang is heading to the scene. But the visual departure from the other newspapers could hardly be more pronounced. The front page of Nanjing’s Yangtse Evening Post on June 3, 2015. It is easy enough to dismiss these treatments as superficial—and in freer news environments they would be just that. But as the Party leadership seeks to appropriate feeling and channel it toward more triumphal themes like heroism and tenacious leadership, with a single uniform face presented to the entire nation, the act of exposing the human face of tragedy can be defiant, even if indirectly so. We may remember that in the wake of the Sichuan earthquake in May 2008, nothing was as dangerous to Party officials as those heart-wrenching images of parents who had lost their children in the collapse of shoddy school buildings. How do we explain those errant touches of humanity in the Yangtze River papers? Was this oblique defiance? Did they try to push harder—just a bit harder—because the tragedy happened so close to home? Were they afforded more latitude by the authorities for the same reason, opening a spillway for powerful emotions? Source: Chongqing Evening News, June 3, 2015, page 3. 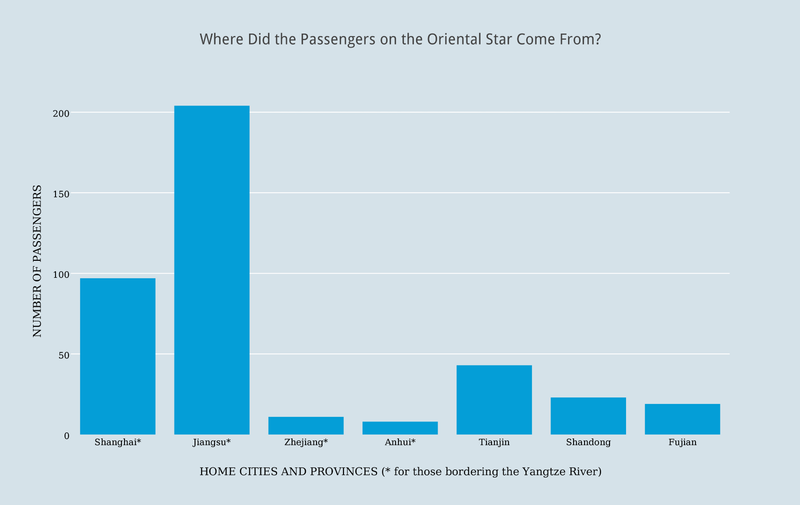 To determine whether or not coverage along the Yangtze River was in any way unique, we might look also at coverage in those provinces with passengers aboard the Oriental Star, but not bordering the Yangtze River (those without a * on the graph above). After all, it’s possible newspapers angled for more sensitive treatment of the tragedy if it involved passengers from their city or province. 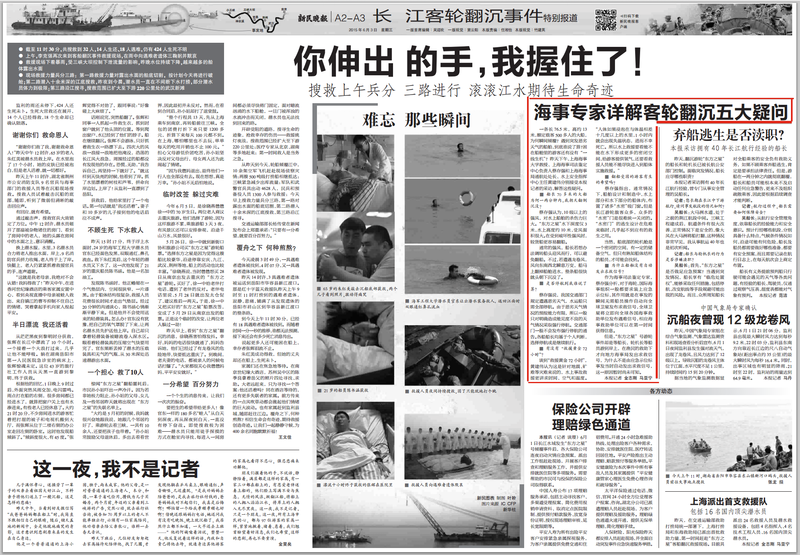 Fujian’s Strait News offers very minimal front page treatment of the Oriental Star tragedy, sticking closely to the official Xinhua version. The results, in fact, are underwhelming. 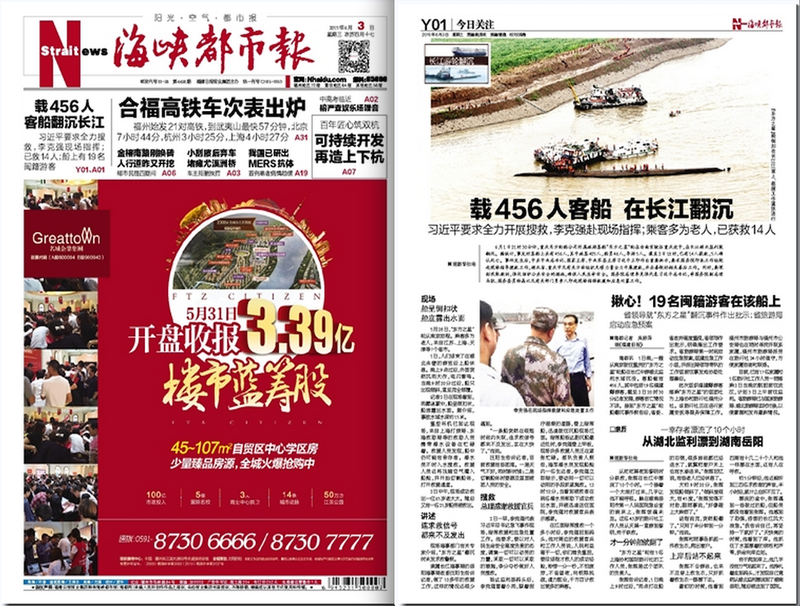 To the left you can see the combined front and inside pages of the June 3 edition of the Strait News, a commercial spin-off of Fujian Daily, the official Party mouthpiece of Fujian province, which had 19 passengers onboard the cruise ship. The only coverage on the front page, which is dominated by a massive advertisement, is a small square of space barely visible under the banner. This is the official release on the incident by Xinhua News Agency. Strait News reporter Zhu Liping, based on Fujian Daily reports —On the night of June 1, the cruise ship Oriental Star, traveling from Nanjing to Chongqing, sank in a mid-stream section of the Yangtze River near Jianli. Of the 456 people onboard the vessel, 19 are travelers from Fujian. As of the reporter’s filing at 8:30 PM on June 2, there was no news concerning tourist casualties. After receiving report of the capsizing of the Oriental Star cruise ship, the provincial Party committee and provincial government gave the matter high priority, with provincial leaders issuing written instructions and raising specific work demands. 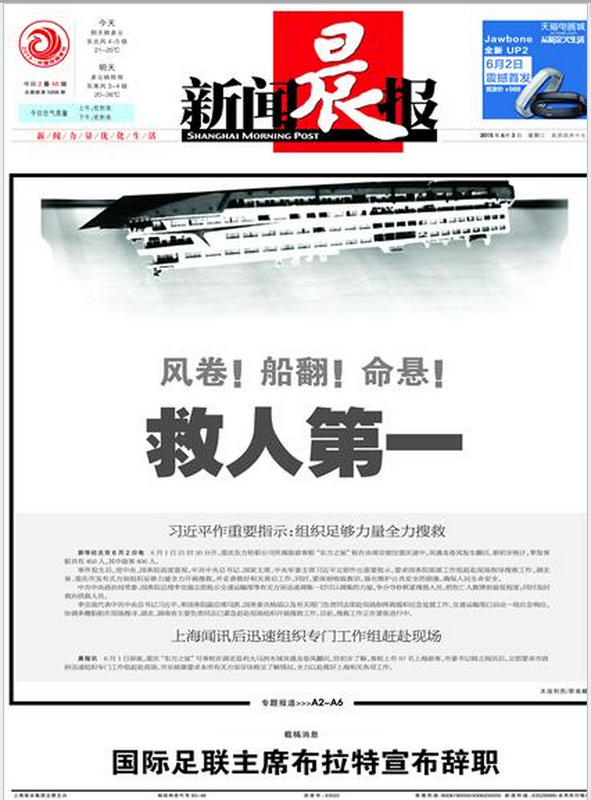 Tianjin Daily, an official Party mouthpiece, and City Express, its commercial spin-off, both play down the story of the capsizing of the Oriental Star. And what about the municipality of Tianjin, which had 43 passengers on the Oriental Star? For newspaper readers there, this must surely be a stirring and relevant story. But here on the right are the front pages of the Party’s official Tianjin Daily, the municipality’s mouthpiece, and of its tabloid spin-off, the City Express. 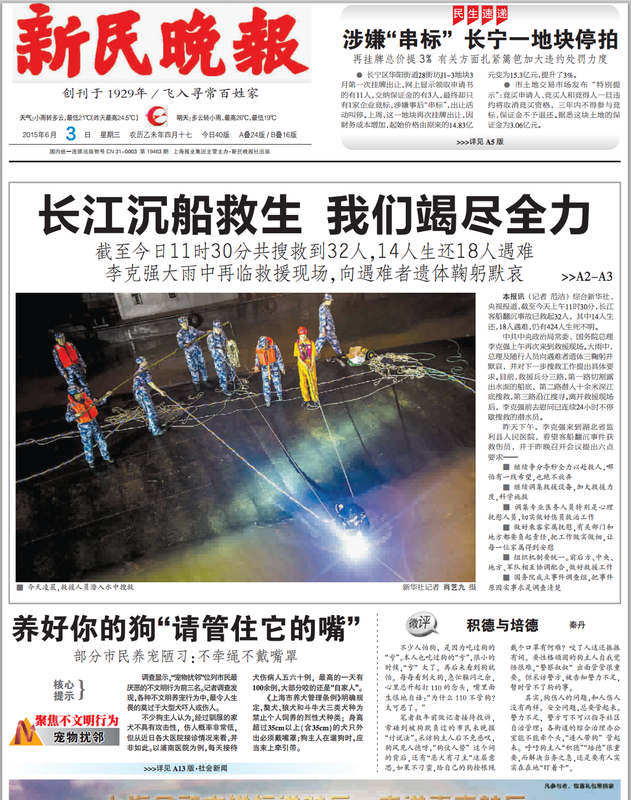 On the Tianjin Daily front page, the Oriental Star story runs vertically along the left-hand side. 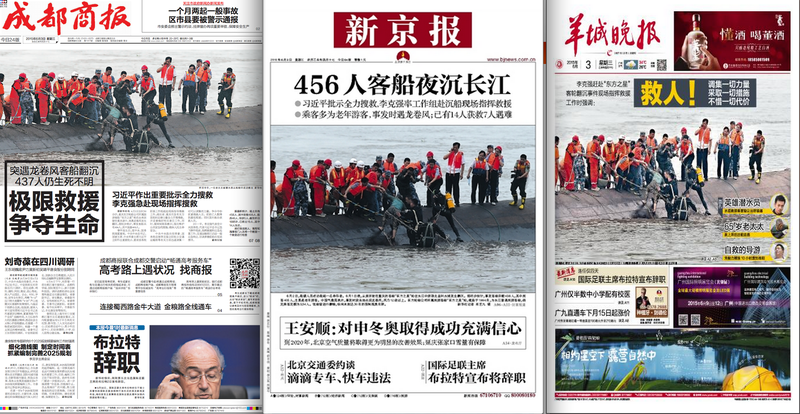 Of course, this is actually the Xi Jinping story, about the call to “expend all energy in carrying out the search and rescue.” There is not a single related image on the page, not even the Xinhua photograph playing all over the country, of rescue workers pulling a survivor up onto the capsized hull. 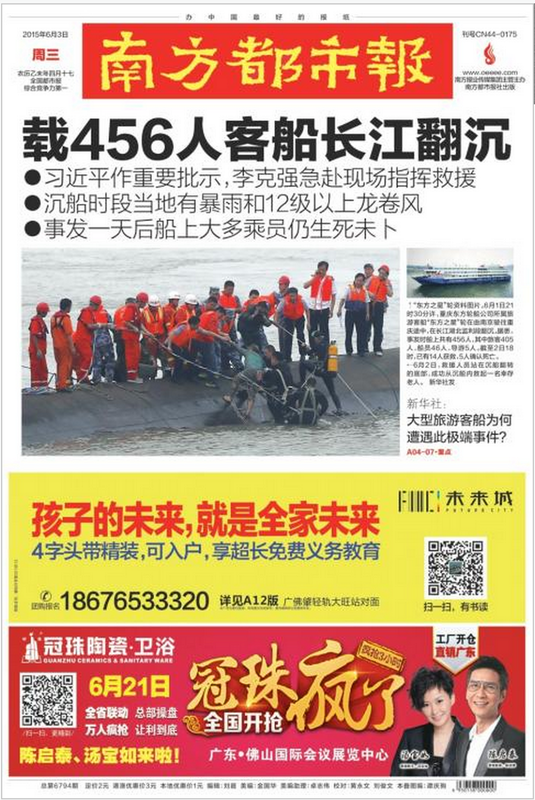 The familiar Xinhua image does appear on the front page of the City Express, along with a headline emphasizing the positive: “A Great Rescue of Life,” it reads. Directly below the image, taking up most of the page, is what looks at first glance like a related infographic. This, in fact, informs readers that outdoor barbecue stalls will be opening soon for summer business in Tianjin—and the authorities, safety ever on their minds, will be carrying out inspections. The Yangtze River seems indeed to have been the thread joining the most genuine and interesting coverage of the Oriental Star tragedy in China’s media. In the past, when we sought Chinese news coverage that broke with the official narrative, the place to look was the southern metropolis of Guangzhou, with its strong reform traditions. But media in Guangzhou have remained under intense pressure ever since the Southern Weekly incident of January 2013. Here are the disappointing front pages of three of the city’s leading commercial newspapers on the morning of June 3. Three Guangzhou tabloid newspapers, from left, Southern Metropolis Daily, Yangcheng Evening News, and the New Express. Southern Metropolis Daily, the paper at the far left, built its reputation on stirring coverage and bold front-page design. 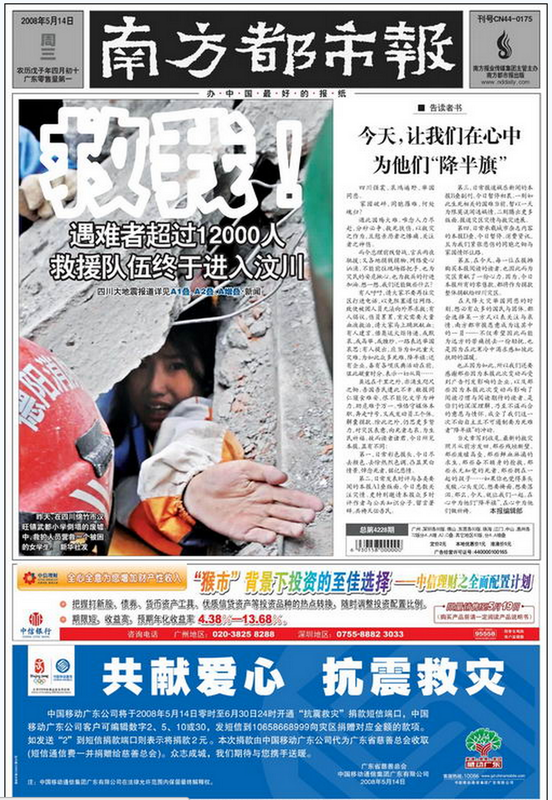 Here, for example, is how the paper’s front page looked on May 14, 2008, the second full news day after the disastrous Sichuan earthquake, for which propaganda leaders had initially sent out a blanket ban on coverage. “Save Me!” reads the simple headline, in bold white over the image of a terrified young schoolgirl trapped in the rubble, extending her hand. The newspaper’s banner has been changed to black and white, a solemn sign of mourning. And to the right of the image is a moving commentary from the paper’s editors. How strikingly different is the June 3, 2015, edition of Southern Metropolis Daily. In opting for a headline blandly parroting the facts from Xinhua, “Cruise Ship Carrying 456 Capsizes and Sinks on the Yangtze River,” it seems as though the newspaper has, in this case, abandoned all pretense of editorial control or professional zeal. This time around, it’s to Shanghai we must look for the most colorful and conscientious coverage of a breaking tragedy. 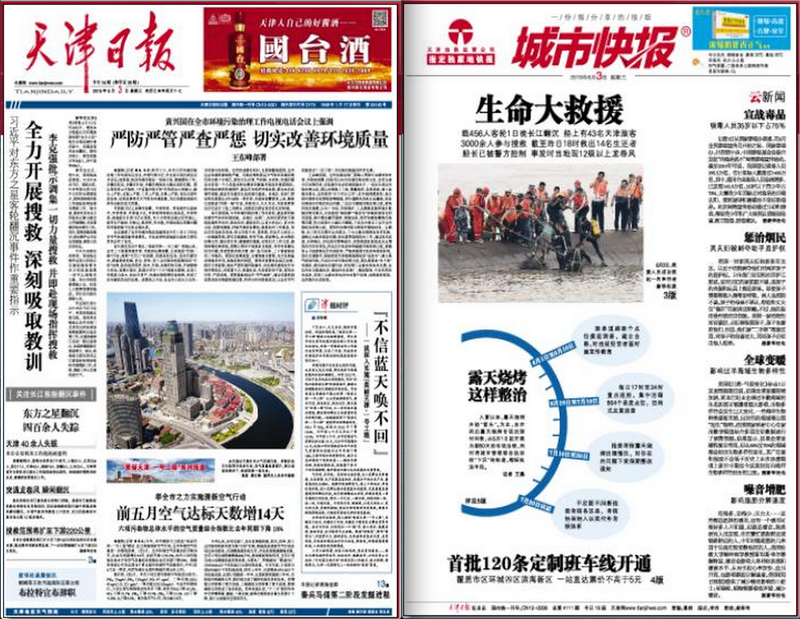 The front page to the right is from the June 3 edition of the Shanghai Morning Post, and it marks an obvious departure. At the top of the page, just below the banner, we see an illustration of the capsized Oriental Star cruise ship. The upturned hull juts up just above the surface of the water, inviting us to more readily imagine the horrors beneath. The large headline reads simply: “Saving Lives Comes First.” But it is tempting, given the blank expanse of white space, to read a further implication—that those tough questions lurking beneath the surface will have to be asked too. The content at the bottom of the front page is chiefly Xinhua News Agency material, about the actions and pledges of President Xi and Premier Li. Below the Xinhua material, we come to a news release from authorities in Shanghai, telling us that there were 97 passengers from Shanghai onboard the Oriental Star and that the city’s top Party leader, Han Zheng, has ordered the formation of a special task force that is heading to the scene of the tragedy. The more proactive response to the tragedy by Shanghai leaders may in fact offer the best explanation, beyond local relevance, of why coverage and treatment of this story by media in the city differed from that in other areas. 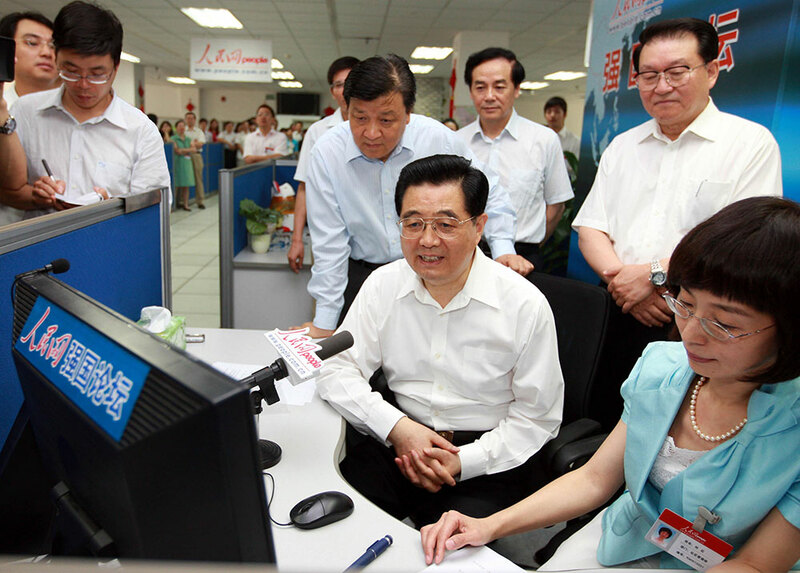 It is possible that Shanghai-based media were emboldened by these official overtures—in much the same way that media across China understood on May 12, 2008, that then-Premier Wen Jiabao would have to travel to the scene of the Sichuan earthquake, and that coverage would have to follow despite the knee-jerk ban from propaganda authorities. The front page of the June 3, 2015 edition of Shanghai’s Xinmin Evening News. 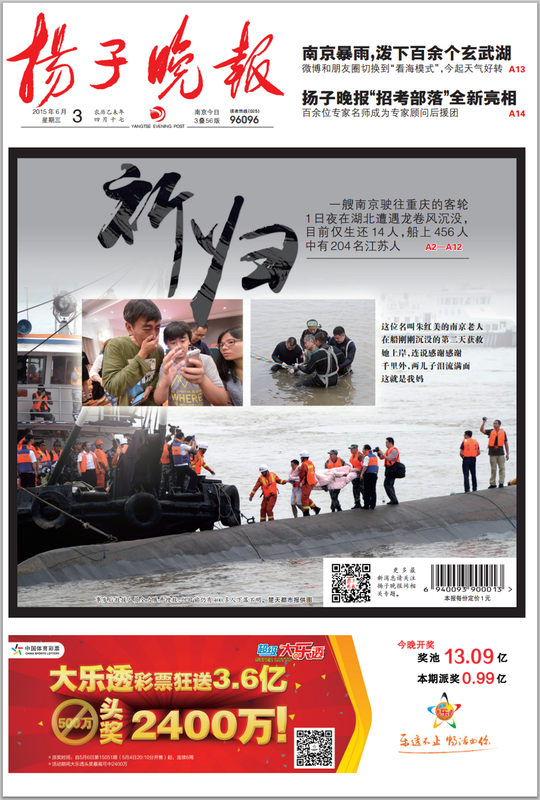 Shanghai’s Xinmin Evening News, published by the Shanghai Publishing Group and directly administered by the city’s Party leadership, did not push the envelope very far with its front-page coverage and design, which you can see on the image to the right. The image is again Xinhua, and the rest of the information is cobbled together from Xinhua and CCTV. A son, his heart brimming with filial emotion, sees his parents off on a journey to see the rivers and mountains of their homeland. He personally escorts them onto their doomed ship. What sort of tragedy is this? At noon yesterday [June 2], I saw a post on WeChat from a good friend: “My mom and dad were both on the ship,” [it said]. I couldn’t believe my eyes. After that, the image of him kneeling and crying was carried in news coverage that seemed to be everywhere. And that’s how I realized this tragedy had actually happened right beside me. He is just an ordinary son of Shanghai, single, not yet starting a family of his own. His parents are a pair of typical Shanghai old people, doing their duty, being kind, living frugally their entire lives, saving up to buy a home for their son’s eventual marriage. Two months ago, his elderly father saw an advertisement for a cruise through the Three Gorges . . .
On the right-hand side—outlined below in red— of the spread was an interview with maritime expert Cai Cunqiang about “five major questions” lingering in the wake of the Oriental Star tragedy. The last of these questions concerned the reasons why the cruise ship had apparently failed to send out a distress signal. A two-page spread just inside the front page of Shanghai’s Xinmin Evening News on June 3, 2015, does include exclusive coverage alongside the Xinhua News Agency version. Why did the boat not send out a distress signal? As an expert in maritime judicial appraisals, Cai Cunqiang says that the International Maritime Organization generally demands the installation of emergency beacons, the purpose of these being that in cases where the crews cannot operate [distress systems] emergency indicators will be activated and a distress signal sent out automatically to the global satellite network, so that the relevant maritime relief bodies can obtain information at the earliest possible moment. However, in the case of the Oriental Star incident, it was only when the captain, chief engineer, and other crew members had made it ashore that they notified the local Maritime Bureau with the help of fishermen and a distress signal was sent out. Why weren’t emergency indicators activated and a distress signal sent out automatically [in this case]? At the moment we don’t know the reasons for this. It is clear from the Cai Cunqiang interview that emergency procedures did not unfold as they should have in the case of the Oriental Star. Looming behind this unhappy fact are a slew of other potential questions about human error that government authorities, local and national, almost certainly find threatening. One of the tactics used most readily by Chinese leaders in the face of tragedy is to emphasize the agency of nature over any possible human causes or contributing factors. The reasons are obvious: How can any human being be held accountable when the earth shakes or the wind blows? Politically speaking, disasters are far more digestible as “natural disasters,” or tianzai, than they are as “human disasters,” or renhuo. Reporter: You are often on the middle and lower reaches of the Yangtze River. Can you tell us about the section of river where this incident occurred? Captain Wu: The Damazhou section is in the middle of what previously was the Jing River section. After the Three Gorges Dam was built, the section improved a great deal [in terms of navigability], and under normal circumstances it is safe. It is extremely rare for strong winds to overturn ships in the Damazhou section. In fact, this is the first time in my 40 years of experience that I’ve ever heard of such a thing. A June 2, 2015, photo from Shanghai’s The Paper, an online news platform, shows trees blown over (possibly by heavy winds) near the site of the Oriental Star tragedy. The Paper, the Oriental Press Group new media site based in Shanghai, offered slightly more elaboration on the question of human error, reporting on June 2 that the Oriental Star, in a rush to reach its first tourist destination, had sped ahead of a second cruise ship departing Nanjing at the same time. The captain of the second ship, it was reported, had decided to stop in Hubei, judging the weather to be unsuitable. This hinted at possible negligence on the part of the ship’s crew, but The Paper also appeared to confirm—with its own observer on the ground—that there had been severe weather in the area. 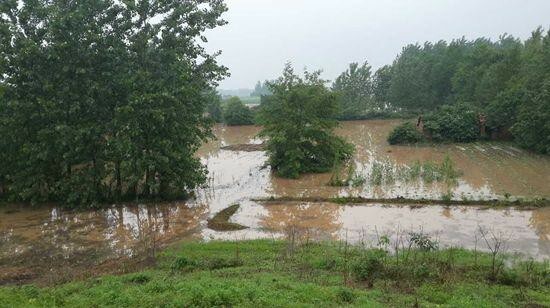 It posted a photo of flooded fields near the site of the capsized ship, where trees had been blown over. The slight variations in coverage we see among papers along the Yangtze River, from Chongqing to Shanghai, show us that not exactly all media slavishly followed the facts dished out by Xinhua News Agency and China Central Television. But nor does this coverage break significant ground. It hardly qualifies as what Chinese journalists call “hitting line-balls,” or da cabianqiu, meaning coverage that sends the chalk flying—still technically in bounds, but somehow, to mix in our own metaphor, pushing the envelope. What we should find most interesting—and perhaps troubling—about the universe of coverage on the Oriental Star tragedy is just how close it was to total, deafening uniformity. After the Sichuan earthquake struck on May 12, 2008, hundreds and hundreds of Chinese journalists rushed to the scene, openly violating an explicit ban from the Central Propaganda Department against coverage from the scene because they knew the story would have to be covered. It was only after an initial period of relatively active coverage by Chinese journalists that authorities managed to drain off dangerous reporting on such issues as the collapse of shoddily constructed schools. Despite a clear determination on the part of the leadership to keep critical coverage of the earthquake at bay, there was little doubt (in my mind, certainly) that Chinese media had the will and the capacity to surge into the gaps. 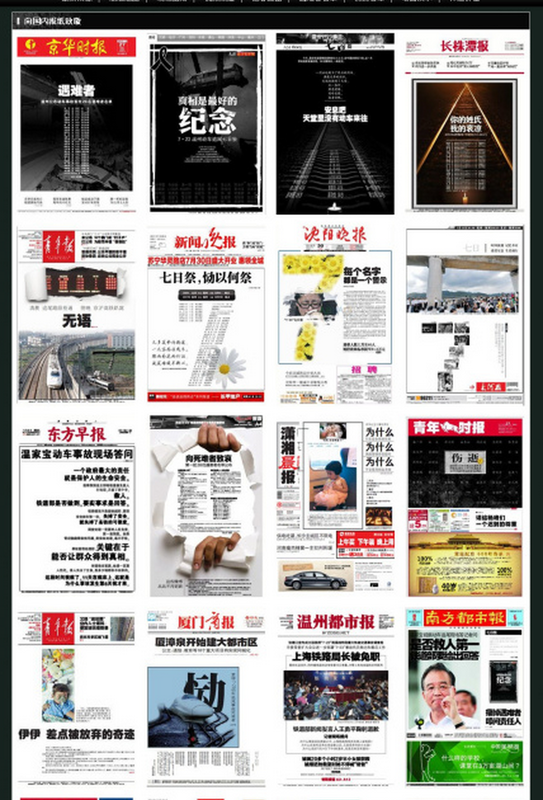 Images of front pages of Chinese newspapers following the June 23, 2011 collision of two high-speed trains outside the city of Wenzhou. When tragedy struck again on July 23, 2011, this time with a deadly train collision, it brought what China Media Project called at the time “a tumultuous week of coverage.” The images, seen at right, are just a sample of the variety we saw on the front pages of newspapers across the country over a period of days. The boldness of China’s traditional media, particularly of commercial newspapers and magazines, was driven in part by the anger flooding across newly popular social media platforms like Sina Weibo. Internet message boards and social media surged with calls for greater transparency in the handling of the Wenzhou high-speed rail crash. Eyewitness videos of the attempted cover-up, including the expedient burying of wrecked train cars, were posted to video sharing sites, and then shared again by millions. Finally, in the face of this torrent of coverage and public anger, Premier Wen Jiabao made a trip to the scene of the crash, pledging a full and transparent investigation, which was eventually released at year’s end. By the time of the Wenzhou train crash, China’s traditional media had suffered already through a seven-year cycle of tightening restrictions that were impacting in-depth and investigative reporting. For example, a central-level ban had been in effect since late 2004 prohibiting the practice of “cross-regional reporting,” or the reporting of stories in one city or province by media from other regions. And yet, as Wenzhou demonstrated, journalists continued—in drips and runnels—to find ways through. Two critical factors have shifted since Xi Jinping formally took office on November 15, 2012. First of all, we have seen an extended and intensified tightening of controls on traditional media, particularly those commercial newspapers and magazines that since the mid-1990s, had routinely given us surprises in the form in-depth, investigative, or explanatory reporting. The showdown at Southern Weekly in January 2013 was the culmination of long-rising tensions over newer mechanisms of prior censorship (such as the installation of internal “readers” and pre-approval of story topics) that made it nearly impossible for more professionally minded media to make advances. Hu Jintao’s 2008 policy of “public opinion channeling” was to a great extent about reasserting the dominance of the Party’s agenda over a commercial press (with professional ambitions) that had become restive and unruly. Readers may recall, for example, how 14 commercial newspapers issued a joint editorial ahead of the National People’s Congress in March 2010, calling for the abolishment of the country’s discriminatory household registration system. That move, an extraordinary show of unity across the professional journalism community in China, certainly terrified Chinese Communist Party officials. The editorial was scrubbed from the Internet and its author, Zhang Hong, was dismissed from his post as deputy editor-in-chief of the Economic Observer. The long and short of it is that commercial media as a progressive force have been quite effectively neutralized over the past few years in China. We have seen, as a result, an exodus of experienced journalists and editors. And because traditional media remain the core of professional journalism practice in China—not least because most online media are still prohibited from having reporting teams—this exodus has meant a very real erosion of professional capacity. Journalists can only sit on their hands for so long. The second shift under Xi Jinping has been the neutralization of Sina Weibo and other social media in China as platforms with the power to drive the public agenda. The Wenzhou rail collision four years ago offered a graphic illustration of how social media and the Internet could galvanize national attention. An upward swell of information sharing and criticism became an unstoppable wave of public opinion, and this in turn empowered traditional media. The first full year of Xi Jinping’s leadership, 2013, gave us two watershed events in media control: 1) the Southern Weekly incident and 2) the crackdown on social media. The former marked a low point for professional media in China from which they have thus far not recovered; the latter has meant effective obstruction of the Internet’s capacity to drive the agenda and empower professional media. We can think of the capsizing of the Oriental Star, the first major tragedy to occur under Xi Jinping’s leadership, as an important test of what kind of disaster reporting is possible under the media environment he has created. The results are not encouraging—and in fact the effectiveness of Xi Jinping’s controls may not bode well for China’s leadership. The hopeful editors of Southern Weekly chose an illustration of Yu the Great as the cover of their 2013 special edition because they understood, and wanted their leaders to understand, that this period of extraordinary challenges and uncertainties had to be met with greater tolerance for ideas and criticisms, that the waters had to be harnessed rather than obstructed. The bulwarks President Xi has built against the current of public opinion may at first seem formidable. But that strength, as the ancients knew, can be catastrophic, like the horrors of Banqiao. After all, stopping the mouths of the people is more perilous than stopping a river.